In Skyfall (2012), James Bond (played by Daniel Craig) is faced with one of his toughest adversaries named Silva (Javiar Bardem) who infiltrates MI6 headquarters. 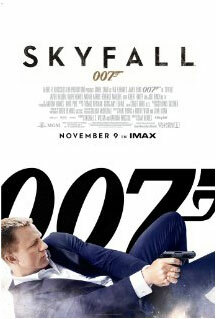 Bond’s loyalty to M (Judi Dench) is also tested when complications arise from her past. Bond is helped by MI6 agent Eve (Naomie Harris), and meets new Bond girl Sévérine (Bérénice Marlohe).